At least 35 people have been killed and dozens injured in a fire at a hospital in Miryang, South Korea, said the Yonhap news agency. Around 200 patients were inside the building and adjoining nursing home at the time - many were safely evacuated. It is South Korea's deadliest fire in almost a decade and the toll is expected to rise. 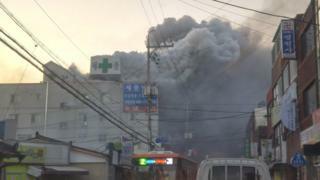 Firefighters told the Yonhap news agency that the victims appeared to have died from smoke inhalation. Several of the injured people were reported to be in a critical condition. Fire chief Choi Man-woo told reporters the cause of the fire was not yet known. "The victims came both from the hospital and the nursing home. Some died on their way to another hospital," AFP quoted him as saying. Mr Choi said the fire started around 07:30 local time (22:30 GMT on Thursday) and was put out in about three hours. According to Yonhap, 93 patients from the nursing home were safely evacuated. Pictures from the scene show the building engulfed by heavy grey smoke as well as patients being rescued. South Korean President Moon Jae-in arranged an emergency meeting to discuss ways of dealing with the fire. Miryang is about 270km (168 miles) south-east of the capital, Seoul. The hospital has been operating since 2008. The nursing home and hospital between them have about 200 beds. About 35 medical staff work at the hospital, according to South Gyeongsang Province officials. The fire comes just a month after 29 people i n the South Korean city of Jecheon were killed in a blaze at a public gym. At least 35 people were killed by a fire which broke out in an emergency room in Miryang. Jin Xing hosts Chinese Dating - a show where parents, controversiall y, decide who their sons can date. 7 days quiz: What was this woman's serial offence?